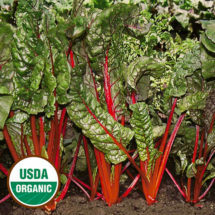 This big, leafy cousin to beets comes in a dazzling variety of colors. 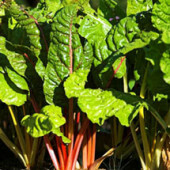 Sow directly in the garden before the last frost and make successive plantings — unlike spinach, heirloom chard is heat tolerant as well as cold tolerant. Well-mulched, it will survive winters in milder climates. 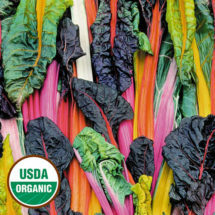 Provides a spectacular rainbow of colors throughout the entire growing season. 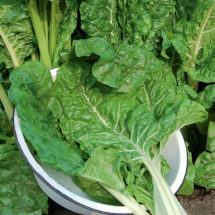 Broad, dark green, heavily crumpled leaves with white veins and sturdy stalks. 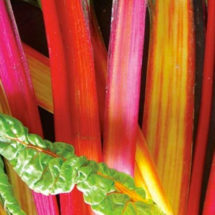 Originally from Australia, this colorful variety is perfect for market growers. Bright red stalks contrast beautifully with heavily crumpled green leaves.